Dubai Shopping Festival is coming back for its 23rd year, and there are tonnes of reasons to get excited. DSF 2019 is kicking off with a 12-hour sale. This year, the huge, city-wide retail event will be taking place from Tuesday, December 26 until Saturday, January 27. This year, there’s a lot going on. DSF kicked off back in 1996 when His Highness Sheikh Mohammed bin Rashid Al Maktoum, Vice President and Prime Minister of the UAE and Ruler of Dubai, wanted to launch a world-class retail event that will attract visitors from around the world. Well, nearly 22 years on and the festival continues to draw in almost 5 million tourists every year. The last couple of years have seen record levels of generosity too, with DSF dishing out a whopping Dhs100 million of prizes for lucky punters, and even a jackpot prize of Dhs1 million given away to one winner. To help you stave off any post-Christmas blues, DSF 2018 is expected to bring even more enormous discounts, prizes, giveaways and more. Where is Dubai Shopping Festival 2018-2019 held? Where is the inauguration of DSF 2019 held? When will Dubai Shopping Festival 2018-2019 start? 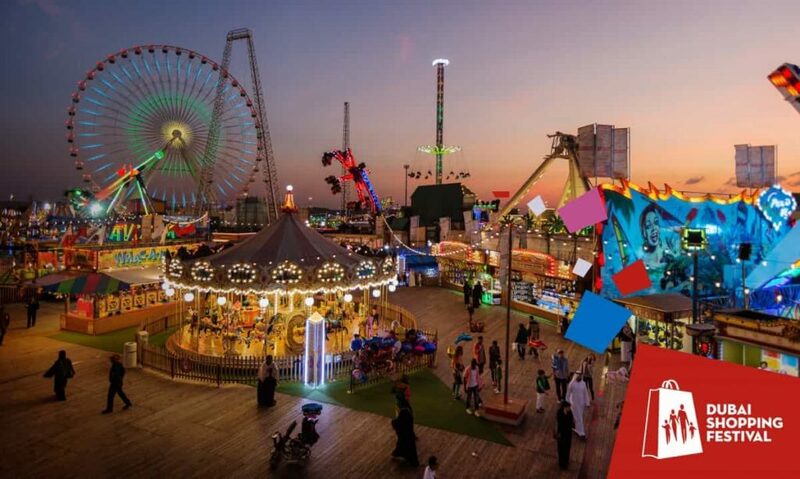 What are the main attractions of Dubai Shopping Festival 2018-2019? The winners of the two daily DSF mega raffles will be announced at the Global Village and broadcast live from 9 pm to 10 pm daily on Sama Dubai TV. Kicking off on December 26 is the enormous 12-hour sale taking place on day one of DSF. Six Majid Al Futtaim Malls are taking part, including Mall of the Emirates, which will see further discounts on already marked-down prices. There will also be a dedicated outdoor marketplace popping up for the festival. “Market Outside The Box” will take place throughout the month-long retail extravaganza, and will feature 80 local and international emerging brands at Burj Park. Expect a jam-packed line-up of music and live performances, plus a pop-up cinema, loads of food trucks and more. You can also catch massive fireworks shows every weekend of the festival at various locations across the city, including Global Village, The Beach at JBR and Dubai Creek, plus live fashion shows taking place in a range of stores during major sale events. Festivities during DSF are usually held all over Dubai. That’s right. Every mall and mostly every retail store in Dubai participate in the festival. To mark the commencement of the festival, various parks, hold firework and fair-styled events. These parks hold fireworks and other events every day to celebrate DSF. What to buy from Dubai Shopping Festival 2019? Though Apparel and Fashion are the strongest pillars of DSF, they aren’t the only things to look out for. The crazy deals on electronic items make it another favorite among consumers. Apart from, the discounts and other offers on electronics, DSF is also the time when companies launch new products. This is because it is a perfect platform for companies as people from all over the world attends the launches. So, you may also get a chance to win these products through raffle draws or other exciting offers. One can buy furniture and various home appliances from a variety of brands at a discounted price as well. If you’re a fan of authentic jewelry, then DSF is your place. The unique designs during DSF and affordable prices make jewelry shopping a necessity among the residents. You will also be spoilt with choices to buy leather bags, leather jackets and cosmetics in DSF. Perfumes from the high-end stores come cheaper after discounts. Watches of different kinds such as diamond-studded or the one with quartz dial, all of them come at an affordable price because of heavy discounts. The Dubai Shopping Festival app organizes DSF packages to provide you with unforgettable experiences. The app also provides packages that include visiting other landmarks around the city. They design every element of your Dubai holiday and have multilingual tour planners who offer you comprehensive travel solutions. It is also recommended to shop early and research well before heading out to shop. A comprehensive guide is often distributed in every mall to highlight all the activities that will take place in that particular mall/place during DSF. Besides, their official website and the regional newspapers will keep you covered for the activities and the offers in DSF. So what happens if shopping isn’t really your scene? DSF is celebrated like any other festival in Dubai: with pomp and show. Which means, the shopping isn’t the only experience to please your soul. There exist a plethora of activities that go on here which you could participate in, apart from shopping. 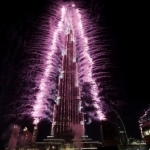 Fireworks happen almost every day in major parks like Creek Park and Zabeel Park. Once you’re here to watch the lovely fireworks, arrive a bit early since there would be a ton of activities and other things to do here. Winter months make it ideal for anyone to stay in the park for a picnic; so while you’re in the park, you can participate in loads of activities organized for kids, magic shows, food tasting carnival, face painting, etc. Throughout the emirate, you’d get to see lots of impressive street plays and live shows by artists and musicians. There are also parades that take place in the downtown area where you’d feel a colorful and vibrant atmosphere. In malls too, there would be various things to do other than shopping. Flash mobs and fashion shows are regular in every mall. In Dubai Mall, the ice rink gets converted to a fashion show ramp. There would be various game shows held in every other mall where you’d be able to win prizes. All around the city, from hotels to malls, from parks to resorts, from landmark destinations to the downtown area, various workshops and exhibitions are held. Celebrity meet and greet are also organized for the public. Besides all this, perhaps one of the main highlights are the raffle draws that take place every day at every mall. Where the lucky winners can take home cars, cash, home appliances, gift vouchers or even gold. If this much isn’t enough, the major film festivals like Dubai International Film Festival and Children’s International Film Festival is usually held around that period, so watch these movies and catch your favorite stars attending press conferences or even as they walk the red carpet. DSF truly teaches one to embrace and celebrate the shopping lifestyle with vehemence. It offers everyone a bouquet of a diverse range of activities, offers, and happiness. This is one of the times where the entire emirate is bustling with vibrant vibes and energy! Several local travel agencies, tour operators, and airlines are operating services to this Festival with special discounted tour packages, targeting people seeking to enjoy this shopping extravaganza. For instance, TrippyGO Tours and Travel based in Kenya has been offering some attractive packages which found to be the best. Imagine with Ksh 65,000 ( USD 629), they will offer you a 4-night accommodation in Dubai, return flight with Emirates, dhow cruise along the Creek, dessert Safari, BBQ Dinner, daily buffet breakfast and on top of that guide you to the best places to enjoy the Dubai Shopping Festival discounts. Add to them transfers and a stay in a luxurious hotel! So book your visit to Dubai early and avoid disappointment.